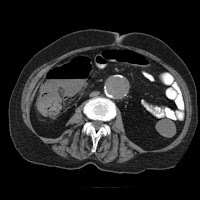 What you see above are ominous CT findings from a recent patient who presented with sudden, severe abdominal pain. The first slice shows portal venous gas and the second one is illustrative of pneumotosis intestinalis. 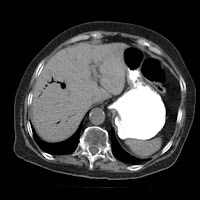 Portal venous gas is a rare finding most commonly associated with mesenteric ischemia and bowel necrosis. Historically, it has portended a grim prognosis (mortality rates 75-90%). The treatment is cold hard steel, ASAP. Did you do a primary anastamosis? what about their ectatic aorta? BJ- It's a 4 cm AAA. Needs watched. This type of case illustrates the importance of early recognition and quick action. Excellent work. I see 3-4 of these a year. They are usually associated with patients who are undergoing dialysis and have hypotension during treatment, or they are diabetic with significant heart disease and have (again) some episode of hypotension. This area of the colon is a watershed zone that doesn't tolerate ischemic insults well. If this patient hadn't had any obvious reason for this to have occurred, I would be concerned that he/she had a silent MI with hypotension. i too have lost a few. have saved a few too. always scary.